Th-INK-ing of You: You Bless Me! Hello friends! I hope you all have been doing well! My family went home yesterday afternoon and I should be getting my house back in order, but instead, since I have been battling a bug and have zero ambition, I decided to play in today's color challenge over on SCS, and this week's CPS268 sketch, which I flipped on it's side. 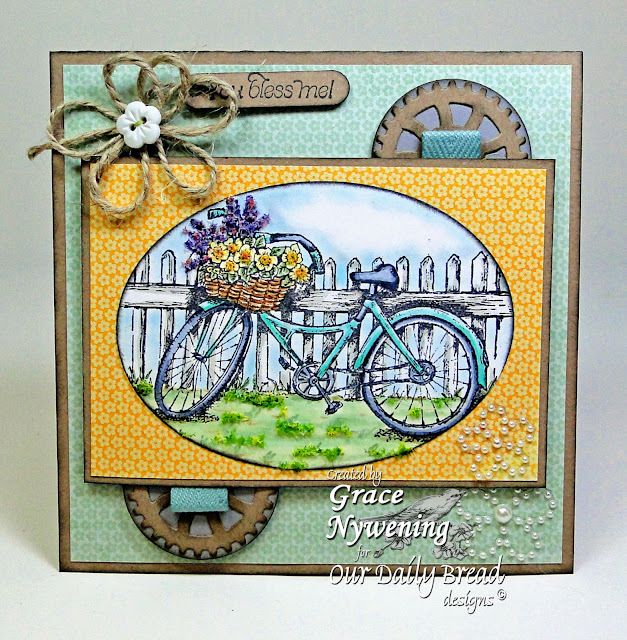 When I saw the sketch I immediately thought of the Bicycle set, released June 1 at Our Daily Bread designs. For the circle elements of the sketch I used Spellbinder's Sprightly Sprocketts die, as well as classic circles. The little tag was stamped with a sentiment from Thank You Sentiments, and cut with a SU! punch. The card base is Gina K and the designer paper is My Mind's Eye Miss Caroline. The image was stamped with Memento Ink on Cryogen white and colored with Copics. I then added several shades of Flower Soft to the flowers in the basket and some grassy spots as well. The twine flower was my "attempt" to use twine in a creative way for the "dessert" option for the color challenge on SCS. Unfortunately I didn't realize the tag had moved a bit for the photo and the "You" of the You Bless Me sentiment got hidden. :( Anyway.... it was a fun and quick card. This week at Stampin' Sisters in Christ, Diane is the hostess, and she chose Isaiah 40:26 as her scripture. Lift up your eyes on high, and behold who hath created these things, and that bringeth out their host by number: he calleth them all by names by the greatness of his might, for that he is strong in power; not one faileth. Stop on over at the SSIC blog to read Diane's devotional. It will bless you for sure! What a beautiful card Grace. Grace! This is amazing! What a fantastic job of bringing together so many different styles in the elements, from sprockets, to twine to pearls! WOW! So pretty, I love the twine flower. Beautiful card Grace, and I love the sketch you have used. Your card makes me feel like biking out in the country. I love the way you used the die cut to simulate the bike tires. Blessings! I just love all of this, Grace. The stamp is darling, the sentiment, the flower soft, the cogs/wheels, and the soft colors. It's just amazing from every aspect. Thanks for sharing this with us in our challenge this week at Word Art Wednesday, and please be sure to join us next week (starting tomorrow) for our double prize week. Its amazing to me how some of you girls can make a CAS card so beautiful.... I have to throw in everything but the kitchen sink! Thanks for joining us this challenge, "Simply Summer" at Fashionista! This is beautiful Grace. I love this new set. Thank you so much for taking the time to link up your talent and creative ideas with us at Make It Monday! Grace, this is gorgeous. Love the flowers in the bike. I may just have to borrow your bike and take it for a ride because it looks like a simply fabulous day with the blue sky with just a touch of clouds. I hope you get feeling better soon. HUGS!!!! Wonderful card, looks so pretty, gorgeous flowers bling bling! Thanks for playing with us at SFC. Wonderful image and fab card. loving all your details, such as the gears and pearls. Saw you on MIM and came to take a closer look, glad I did. PS. I have candy on my blog if you're interested!! This is really pretty, Grace....the image is colored beautifully and I just love the flower you made from the twine!!!! Very nice card - great motiv. Thanks for joining SFC. For The Love of Good Steward Hop! Pics of our Father's Day getaway! Pink & White Challenge - Happy Birthday! By His wounds, we are healed!